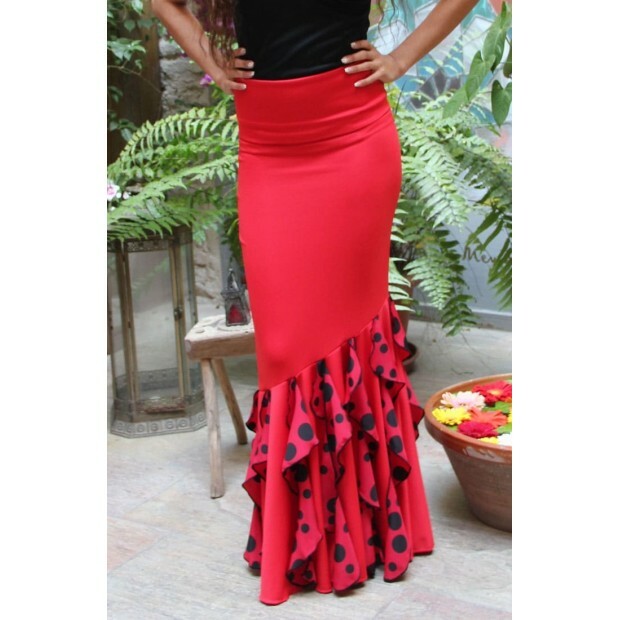 Red flamenco dance skirt fitted with ruffles. Red skirt trimmed mid-thigh with very wide diagonal steering wheel and red pendant ruffles with black polka dots. Also has a brush to turn. Size 38 ... 69-71 / 93-97 / 100 cm. Size 40 ... 72-74 / 98-100 / 100 cm. Size 42 ... 75-77 / 101-103 / 100 cm. Size 44 ... 78-80 / 104-106 / 100 cm. Size 46 ... 81-84 / 107-109 / 100 cm.